Barb Wire Leather Cords 2.5mm round, metallic color - copper. 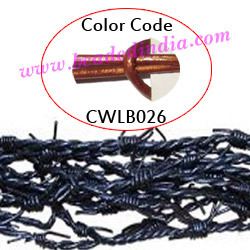 supper quality 2.5mm round barbed wire leather cords, metallic color - copper as per the photograph, pack of 25 meters. Leather Cords 2.0mm flat, regular color - red. Silver Plated Fancy Beads, size: 16x14x13mm, weight: 2.81 grams. Silver Plated Brushed Beads, size: 12x12x3.5mm, weight: 1.49 grams. full sleeve long khadi yoga kurta, size : chest 50 x height 34 inches (extra large). Silver Plated Headpin size: 2.5 inch (63 mm), head size : 6mm, weight: 0.48 grams.